Housing prices across Israel have increased substantially in recent years – what is driving this phenomenon and what can be done to reduce housing demand, increase housing supply and reverse the trend? The high cost of housing and various proposals to address this challenge have captured significant attention among the Israeli public and policymakers in recent months. Toward the end of February, an official government report was released addressing this very subject, sparking renewed interest and debate. Taub Center Senior Researcher Dr. Noam Gruber explored the failures and potential solutions for solving the housing crisis via an in-depth study published in the State of the Nation Report, 2014. As shown in the first figure, the period between 2000 and early 2008 was characterized by stable, even declining real housing prices. Following a sharp decline in interest rates in 2008, however, the trend in housing prices began to change and prices have increased rapidly since then. Between their low in April 2007 and July 2013, housing prices increased by 84 percent nominally or by 53 percent in real terms (i.e., after accounting for inflation). Rental prices followed similar trends, although they have increased less quickly than housing prices. 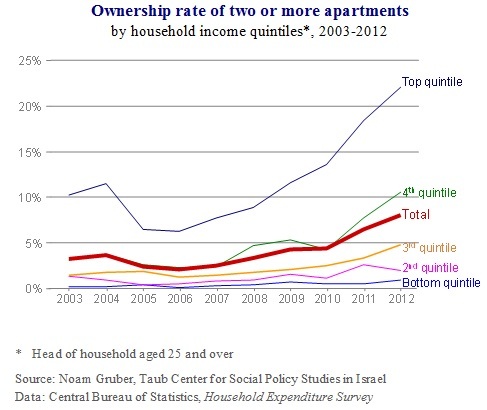 As seen in the second figure, the share of Israeli households owning more than one apartment nearly quadrupled in recent years, increasing from 2.1 percent in 2006 to 8.1 percent in 2012. Examining this trend by income level reveals that higher-income households are largely responsible for this increase; the share of households in the top quintile who own two or more apartments increased by 16 percentage points – from 6 percent in 2006 to 22 percent in 2012. Investor entry into the residential real estate market is due to low interest rates on the one hand and the relatively low taxes levied on rental income on the other. As a result, the residential real estate market has become too expensive for younger households, who are being pushed into the rental market. Gruber recommends that rental income be taxed in a similar manner to other income sources, which would reduce demand for residential real estate as an investment vehicle. Surveys of construction companies point to lack of available land for construction and building permit delays as the two main barriers leading to rigid housing supply, which in turn drive increases in housing prices. 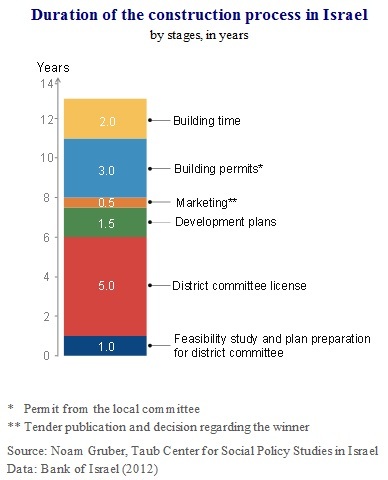 The third figure shows the length of various procedural stages required to obtain a residential construction permit in Israel. Overall, the process takes an average of 13 years, with actual construction accounting for only two of those years and the rest devoted to bureaucratic procedures. The stages that are particularly long are obtaining district committee approval (an average of 5 years) and obtaining local committee approval (an average of 3 years). In contrast, the time required to obtain a building permit in most European Union countries is only 8-12 weeks. The two lengthy steps in the process of obtaining district committee approval include fulfilling application conditions and fulfilling licensing conditions. The delays here often stem from stakeholder opposition to building plans and insufficient infrastructure in place to support the proposed construction. As noted, insufficient release of land for construction by the state and a very centralized planning process hinder the expansion of housing supply. To address these issues, Gruber recommends that the state relinquish control of land to local authorities – which may facilitate more rapid construction – and only retain those areas that are important for environmental protection or needed for construction of national infrastructure in the future. To speed up the permit process, local authorities, rather than the central government, should assume control of all aspects of land development. These include the power to approve development projects and the responsibility for establishing necessary infrastructure – as well as receipt of the resulting income stream. If these aspects were concentrated at the local level, it would remove the current conflict of interest (and the resulting project delay) between the developer, who wants to build, and the local authority, which incurs significant costs due to infrastructure development but receives little benefit from the construction. In addition, in order to promote urban development, Gruber recommends allowing, by law, the sale of condominium buildings via a supermajority decision – a common practice in various places worldwide – as an alternative to the current vacate-and-build or National Outline Plan 38 programs. 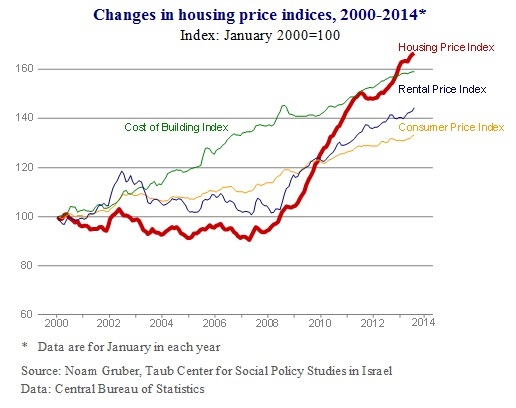 Gruber’s research addresses the very real concerns among Israelis with regard to housing prices in recent years. Today, young and lower-income Israeli families are forced to choose between taking on larger mortgages or paying increasing rents and further delaying their hopes of home ownership. According to Gruber, both demand and supply-side policy solutions are available and should be implemented thoughtfully to ensure protection of environmental resources, sufficient infrastructure development and overall quality construction and affordable housing options for the Israeli public.